Running This Race Called "Life"
Imagine that life - with all its twists and turns and decisions and issues - is one of those muddy, obstacle-filled Spartan races. Now imagine having to run that race on crutches. That’s life with a brain injury. 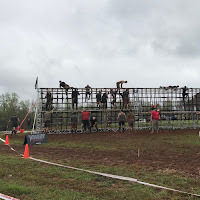 I have all the same hills to climb and obstacles to navigate as everyone else - parenting (we are in the pre-adult/college decision/freedom-giving stage right now), marriage (it's awesome, but definitely not easy), regular adulting (laundry, bills, cooking), etc. - but I'm trying to run this race on crutches (so to speak). I keep getting stuck in the mud, and I'm exhausted. I went to bed last night overwhelmed with it all. I'm tired. So very tired of trying to do life with half my brain tied behind my back. It makes everything hard - what to have for dinner, "can I handle doing laundry and going to the store all in the same day? ", even planning a family get-away (ever thought about how many details go into leaving town for a few days?). So I went to bed just "done" and frustrated that, by not healing me, God is asking me to keep going, even with my injury. I was tired and mad at God. thing in the morning. I highly recommend it.). Today's passage was Psalm 73. I encourage you to read the whole thing, but I'll give you a summary. The author of the psalm is fussing at God about how the wicked seem to succeed while he - a God-follower - is struggling. Verse 3 particularly stuck out at me - "For I was envious of the arrogant when I saw the prosperity of the wicked." 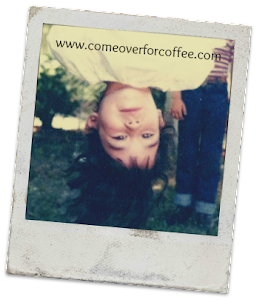 Tweak one or two words, and you get my perspective - "For I was envious of the healthy when I saw the ease of life of everyone around me." As I read on, I found myself really relating to the author. He's talking about how unfair things seem. I get that! But I kept reading. In verse 23 and 24, the author - and I - got some perspective - "you hold my right hand, you guide me with your counsel". God has not left me alone in this obstacle-filled life. He is holding my hand and offering me counsel! And not just me - that offer is for everyone! Can you picture it? 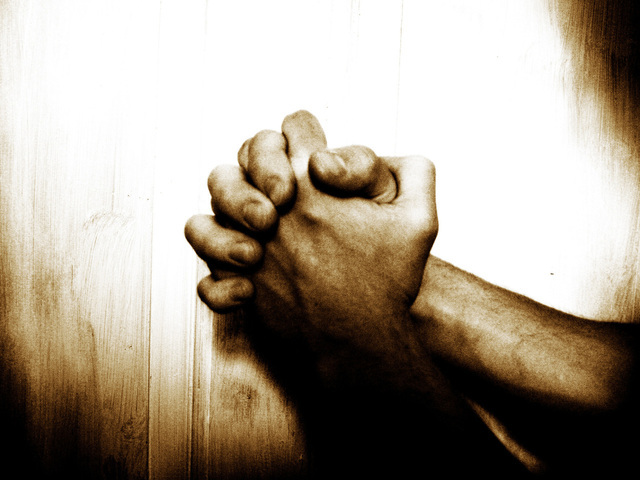 As we try to navigate this life, the God of the universe has offered to hold our hand and give us counsel! The psalm goes on in verse 26 with one of my favorite verses - "My flesh and my heart may fail, but God is the strength of my heart and my portion forever." I often put the word "mind" in for "flesh" just to make it more personal. As I run this race that is my life - as you run your race - God is offering to be our strength. He knows the race is hard - He walked this earth and navigated His own race - and He wants to hold our hand, give us advice, and strengthen us for the journey. So what now? How do I face this new day - as I type this, my head hurts, it's a struggle just to walk a straight line, and all I want to do is go back to bed, but I have a to-do list as long as my arm. I have a race to run. So what now? The apostle Paul mentions running a race a few times in the New Testament. He says we need to run with endurance with our eyes fixed on Jesus (Hebrews 12:1-2). He also tells us to run to win (1 Cor 9:24). 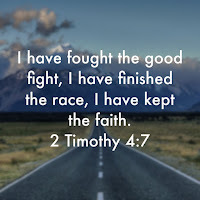 And Paul sets an example of what we should be able to say at the end of our lives: I have fought the good fight, I have finished the race, I have kept the faith. (2 Tim 4:7). 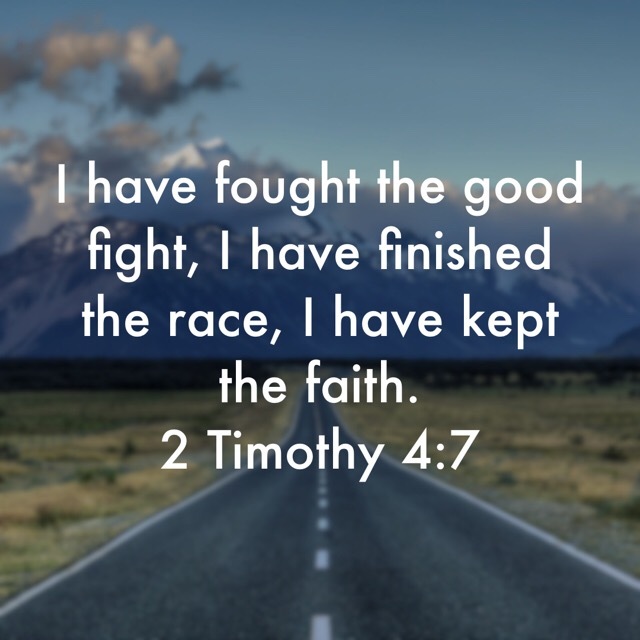 I want to be able to say I "fought the good fight, finished the race, and kept the faith". Can you imagine being able to say that at the end of our lives? That, relying on God's strength, we accomplished the things God had set out for us? That finish line statement is only going to be true if I run each day, each hour, each minute with my eyes fixed on Jesus. I can't be looking around at other people, comparing my race to theirs. I need to let Him hold my hand and give me the strength to run this race He has set for me - day by day and, sometimes, minute by minute. My prayer today is: Jesus, this race is hard! Help me to keep my eyes fixed on you. Help me to know that you are holding my hand and ready to give me advice as I climb the obstacles and even get stuck in the mud. Help me to run with endurance so that someday I can say that I finished the race and kept the faith.